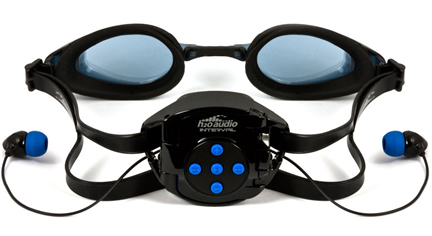 The Interval's waterproof housing and integrated waterproof headphones attach easily to any swimming goggles. 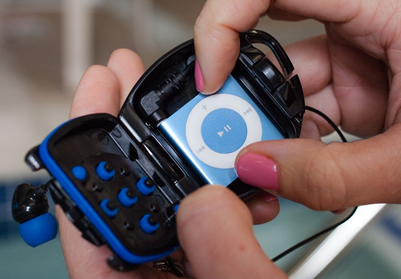 The Interval is the only waterproof iPod case designed just for swimming. The waterproof case for the iPod shuffle 4th generation has integrated Surge 2G headphones and easily attaches to most swim goggles. The waterproof iPod shuffle 4th gen version of the interval waterproof headphones system features a variety of earplugs sizes for a great fit. Designed for the 4th Gen iPod shuffle. Integrated goggle loops make it easy to attach and remove the case from almost any swim goggle. Short headphone wires make it convenient to contain your personal sound system entirely on your head keeping your arms free of wires. Easy to use, push buttons that align with the iPod button controls for playback and volume control in the water or out. Includes 5 sets of Elastomer earplugs (XS-XL). Find the size that's right for you to ensure headphones stay securely in place while swimming. Compatible with the Pro Fit Kit accessory for even more earplug options. Integrated into the case, the Interval features bass amplified Surge 2G headphones. Ergonomic sheared shape sits flush with the ear and is designed to promote proper alignment of the earbud with the ear canal for superior sound and fit, plus and less drag in the water. The Interval is no longer just for the pool. The sport visor made with highly breathable mesh fabric features specially designed Velcro straps to securely integrate the Interval Headphone System into the back of the sports cap.